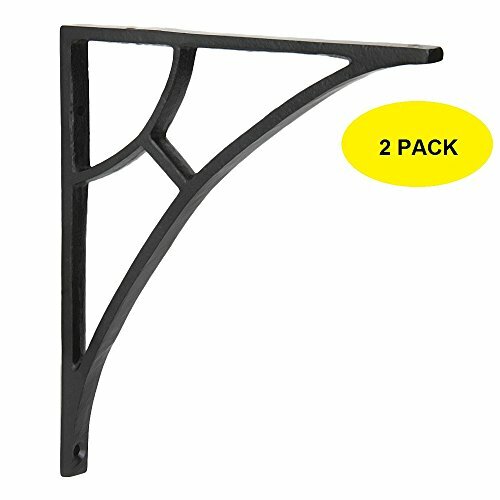 The unique arch design of these shelf brackets allows the shelf to be the focal point in your home. Made from solid iron, the black powder coat finish ensures its longevity for years to come. VERSATILE ADJUSTABLE SPACING: These authentic designed shelf brackets are HANDCRAFTED in SOLID IRON and are ADJUSTABLE in both directions, so mounting them on either direction can be done which makes it easy for you to use according to your convenience. These brackets can hold upto 7" deep shelves. DIMENSIONS: The dimensions of the brackets are as follows; LENGHT: 6 1/2" ; Height: 6 3/4" H ; Width: 3/8". Sold as a Set of 2. The pack includes screws as well which will help you secure the brackets safely. UTILITY: These brackets can be used for decorating your home office or store shelves. They can also be used for mounting cisterns, sinks, roof supports, columns, pillars. and frames giving an extra edge to your decor. BLACK POWDER COATING FINISH: These brackets are BLACK POWDER COATED which is baked on finish. This is done to keep away rust & premature wearing, Keeping the shelves look pristine for as long as you need them also adds a natural shine to them. STEPS TO INSTALL: For fixing screws on any wooden surface, mark and drill pilot holes with a drill bit appropriate for the mounting hardware. Insert and tighten the screw. Do not over torque the screw as it may break. If the bracket is being fixed on a hard surface, a wall anchor may be required. These are available at hardware stores. If you have any questions about this product by A29, contact us by completing and submitting the form below. If you are looking for a specif part number, please include it with your message.